Heat oven to 375°F. Line small cookie sheet with parchment paper. Sprinkle pepper on both sides of steaks. In heavy 10-inch skillet, heat oil over medium-high heat. Add steaks; cook about 1 minute on each side, turning once, or until browned. Transfer steaks to plate. Spread top of each with 1 tablespoon pesto. Cover with plastic wrap; let stand 20 minutes at room temperature to cool down for easier handling. Meanwhile, on lightly floured work surface, separate dough into 2 rectangles; firmly press perforations to seal. Roll out each rectangle into 5 1/2-inch square. With 1 1/2- to 2-inch heart-shaped cutter, cut 2 heart shapes from 2 corners of each dough square; set hearts aside. Place 1 steak pesto side down in center of 1 dough square. Fold opposite corners up and around steak; repeat with remaining 2 corners. Smooth and shape dough to encase steak; place seam side down on cookie sheet. Repeat with remaining steak and dough square. In small bowl, beat egg and water well with fork or whisk. Lightly brush top and sides of dough with egg mixture. Place 2 dough hearts on top of each overlapping slightly; lightly brush hearts with egg mixture. A traditional Beef Wellington is an entire fillet of beef that has been covered with liver pâté or a seasoned mushroom mixture, wrapped in pastry and baked. 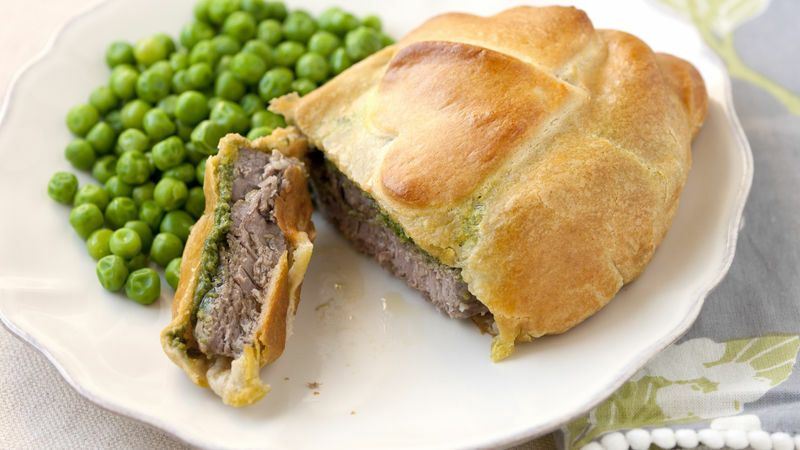 These individual Wellingtons are perfect for a special Valentine’s dinner. If beef tenderloin steaks are irregular in shape, tie with kitchen string before browning. Remove string before wrapping in dough.